Hibs have signed Charlton's Nigerian striker Akpo Sodje on an 18-month deal. The 30-year-old, who converted from defence to attack, had previous spells at Huddersfield, Port Vale, QPR, Darlington and Sheffield Wednesday. 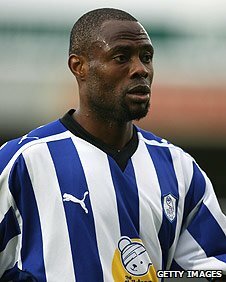 Manager Colin Calderwood turned his attention to 6ft 2in Sodje after failing to bring Daniel Bogdanovich to Easter Road from Sheffield United. And Dutch midfielder Edwin de Graaf has returned to his home country in a loan deal with Rotterdam side Excelsior. De Graaf joined Hibs on a two-year deal from NAC Breda last summer when John Hughes was the manager at the Leith club. He had played in the Eridivisie, the Netherlands' top flight, for a decade but has returned home until the end of the season in the league below. Sodje, who is the younger brother of Nigeria internationals Sam and Efe, told the Hibernian website: "I'm really pleased to have agreed the move to Hibernian and excited about the challenge ahead. "Just looking around the city and the stadium, you immediately understand what a big club Hibernian is in Scottish football. "I have been impressed with what the manager has said about his plans and want to score goals to help Hibernian climb up the table." Calderwood said: "Akpo has played in the English Championship before and will bring something different to our attacking armoury. "I've been following his progress since he was at Port Vale and scored 14 goals in one season." Also on the final day of the January transfer window, Hibs released captain Chris Hogg, sold Merouane Zemmama to Middlesbrough for an undisclosed fee and signed Czech goalkeeper Jakub Divis on loan.